Smartphones have become a near necessity in life, so why buy a new case every time you get a new phone? 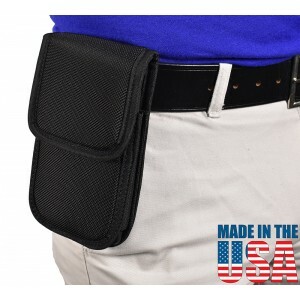 The All American Covered Phone Holster is the perfect multi-purpose companion for large smartphones and will last longer than your cell phone provider's contract.Our case is lined with foam and has a cover to protect your phone from the elements and potential scratches from bumping up against objects. The Slip-proof black metal oxide belt clip firmly grips your belt or waistband and wont come loose or fall off when you pull out your phone. Our phone case is Proudly Made in the USA .! Our case has ultra durable stitching throughout with double stitched seams on stress points for added strength and durability. Keep your phone easily within reach with BlueStone Safety's All American Covered Phone Holster!